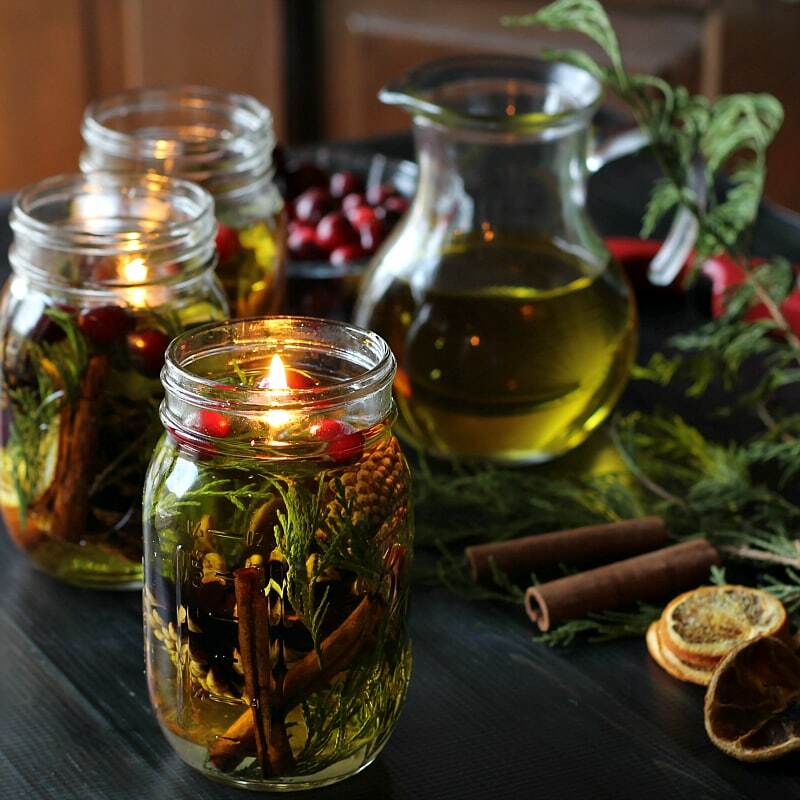 This mason jar oil candle lamp is created with beautiful pine cones, evergreens, and cinnamon sticks, combined with essential oils make great gifts for the holidays. Every year I make a handmade gift for my friends, family, co-workers, and others we want to thank at Christmas time. In the past, I’ve made bayberry candles, simmering potpourri and spice mixes. This year I decided to make a mason jar oil candle lamp, that looks pretty and smells nice too. I noticed that a lot of people were making oil candles for the summer with citronella, and several survivalists using vegetable oils for an extra lighting source when the power goes out. One of the articles specifically talked about using olive oil, as it burns well without an unpleasant odor. That’s where I started. I wanted the oil candle lamp to smell nice so I used scented pine cones, cinnamon sticks and added some essential oils. The first few I made were so beautiful. I packed them with botanicals, drilled a hole in the lid and added a cotton wick. The wick would only stay lit for a minute or two, even after letting it soak overnight. So after some research and experimentation, I found floating wicks , often used for Menorah candles at Hanukkah. I was so happy because I had already bought all the materials for many, many gifts. I did have to replace a few lids, and I no longer needed the cotton rope, but everything else was still viable. Safety Caution: Candles need to handle properly. According to the National Fire Protection Association, many candles have started home fires. Never leave the candle burning unattended. Make sure the candle is set a sturdy surface away from anything that can catch fire. Keep them out of children’s reach. See NFPA’s candle safety tips page for more details. 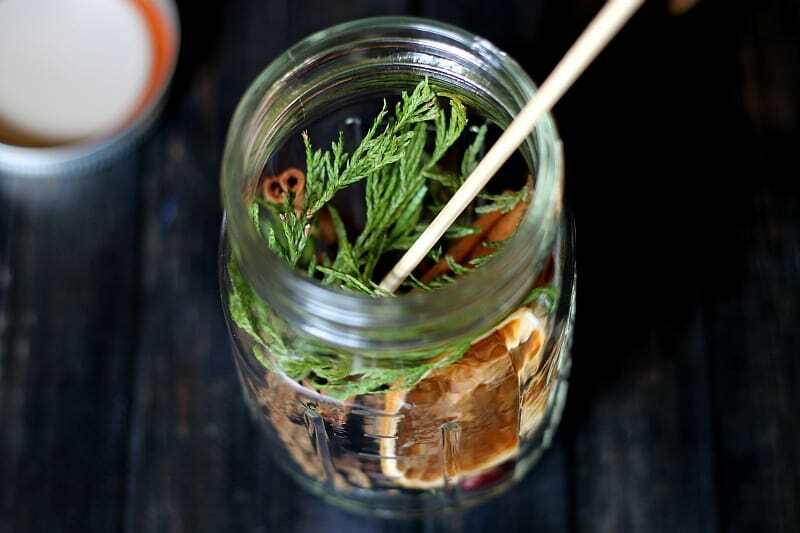 Start by filling the mason jar with botanicals. You can see I’ve used cranberries, dried orange slices , pine cones , cinnamon sticks and some fresh cedar from the yard. Don’t stuff them too full. You need to leave some room for the floating wick. Using a wooden skewer, an old pencil would work too, position the plant material where it looks best. Add some essential oils to your oil. I used light olive oil because it is the least scented, and cheaper than extra virgin. For essential oils, I used rosemary, sweet orange, and lemon. Cinnamon oil would be great too. Just remember that cinnamon and rosemary are pretty strong so be careful when adding them to the jar. Fill the jar with oil, then add your floating wick. As the oil burns, you can add some water, which will make the oil will rise, and allow you to burn the candle longer. However, if the candle goes unused the water will turn and bacteria may start to grow making the candle cloudy. It’s best to just add more oil to raise the level above the botanicals. You can also use a piece of an old candle’s wick when the original one burns up. 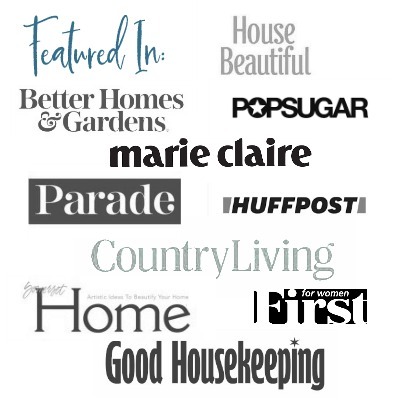 Update: One of my readers asked if they could use artificial materials. I haven’t tried it but as long as you keep them below the flame I think they would work. And, you may not have a bacteria problem when adding water. I’m adding these tags to my gifts. Feel free to copy them. You can right-click to “save as” and print them as you would a photo or insert them into a Word document. Once I figured out how to make them, it was pretty easy to put several together in one sitting. Another Tip: Since I would be traveling with many of them, I decided it was best to tape the floating wick to the top of the jar with a little washi tape, so it wouldn’t get lost in the oil while traveling. This is what I’m referring to on the directions tag. for more great handmade gifts and project ideas. I bought artificial pine and berries and cut them to size ..will these work. I can’t say for sure because I’ve never tried using artificial pine and berries but it seems like it could work. I don’t know if the oil would react with the materials and cause fading etc. over time?? You should definitely try one first and see how it does. I’m having trouble with my pinecones floating to the top of the jar, I’m afraid it’s going to catch fire? How did you get everything to stay down? I used a wooden skewer to push them under the oil level and basically made sure I used enough materials to fill up the jar. I did not have a problem with them catching on fire, but you do need to add oil to keep the floating wick going. You can try water and it will lift the oil level but after a while the water starts to turn cloudy and doesn’t look as nice. Can anyone tell me what kind of cranberries do i need to use? Do they need to be a dried version or what? Hello I just found this. 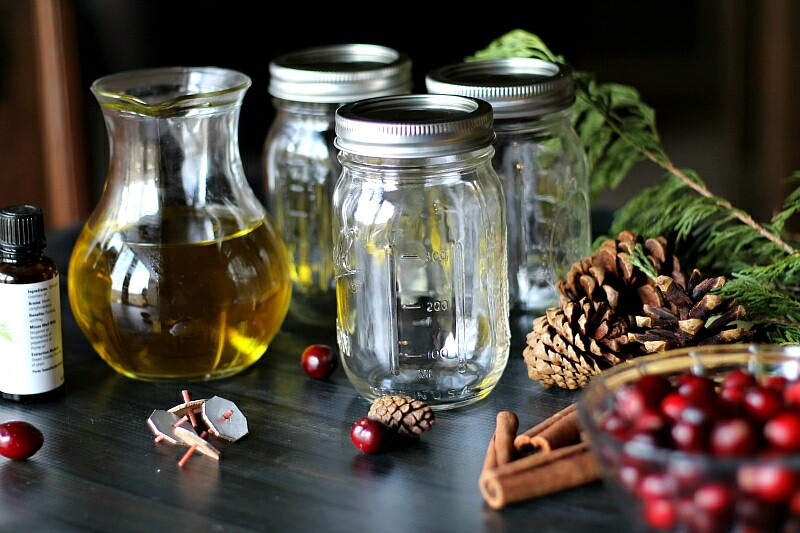 English is not my first language so I am struggling to understand how to fill the mason jar with water and oil… So do you fill water up first all the way to the top but enough room for the floating wick then top it off with light olive oil then add the floating wick on the top? Correct me if I am wrong. Thank you in advance. The best thing to do is fill them all the way with oil. Then refill with oil when the level drops. Some people do add water to raise the level, but I found that using water can cause cloudiness. Hope that helps. I can’t say if the dried contents lasted longer. There didn’t see to be a difference. However, unless you think this is going to be used up quickly I would stick with add oil instead of water to raise the level. Water tended to turn cloudy after a couple of weeks. You can find more recipes like this under the diy/projects tab. There are several soaps, candles and potpourri items that may interest you. Enjoy! Hi, I love this idea! Currently planning on giving it a try this holiday season. But I was just wondering, will all of the stuff in the jar still smell while it’s burning if you don’t put any essential oils in it? Honestly, I don’t think so. They are more for visual appeal. There may be some scent but not enough to scent a room. That being said, you could test one to see if you like it. Hi there, I was wondering if I would be able to put raspberries/strawberries/blueberries into the jars to make a berry candle? If so do I just put them in fresh or is there a specific route I have to take to make them? Thank you so much!! I would be concerned with the water content in berries. Have you ever noticed how quickly raspberries tend to mold a day or two after you buy them from the grocery store? However, I have not tried it. I would certainly suggest trying one and waiting a week to see if it is a problem before making more. This is a wonderful idea. TY. 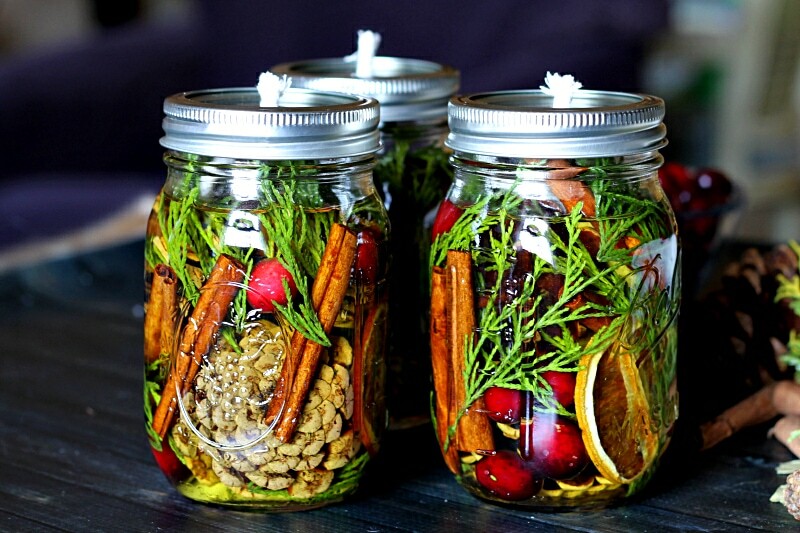 Im starting an looking for mason jar projects for this xmas. This will be perfect. I was wandering if vinegar would work too. I seen a piece on science show. The guy took xmas tree branches n vinegar put in pickle jar for 6 wks. Says it was scented like pine sole. And you can clean with it. Very strong. But idk if vinegar burns like oil. Wat do think? I don’t think the vinegar will burn but you might want to try using vinegar and adding some oil on the top for burning. Definitely test it out on one first before buying to much for your gifts. I love your lamps and really have to try this. Thanks Patti!! Could you use lamp oil for this project? I have never used lamp oil so although it would seems ok, I cannot say for sure and would suggest you do some research on it. I love the candle! Do you think canola oil or any other cheaper oil would work just as well as olive oil? I am making these for gifts this year! I love this idea! I have made one to try a test run and see how it turns out. But I’m running into one problem. All of my stuff (pinecone, dried orange, cedar branch, and cranberries) have all floated to the top so I cannot put a wick in it to float because my pincone is sticking out of the oil. Have you had this same problem or have any advice on how to get the stuff to not float? I do not remember having that problem. I did pack mine pretty good so maybe that’s the problem. You don’t need a lot of oil at the top but the pine cones should not be sticking out either. Try using an old pencil or skewer to push the material down and around to see if this helps. Add more materials too. Also, I don’t know if this would work but I have seen other projects where people used small floating candles on top. The weight of the candle may help but I’m not sure. These look absolutely fantastic!! I would like to make some for my mother and sister in law for Christmas. Would it be safe to ship them via USPS if packaged carefully? I live in California and they are in Colorado. I’m sure there is a way to ship them however I have no experience. I would suggest you ask someone at the post office or USP/FedEx for advice. I’m sure your family will love them. Thank you so much for sharing this idea. I love it and I’m going to make them for coworkers and neighbors this year. I made a tester while I’m waiting for the rest of my supplies to come in and I’m wondering if there is a way to increase these scent throw as they burn? Are there oils that are better for this than others? I’m also wondering how long the floating candles wicks last? Some oils are definitely stronger than others but the quantity could get pricey. I really relied on their beauty more than the scent. 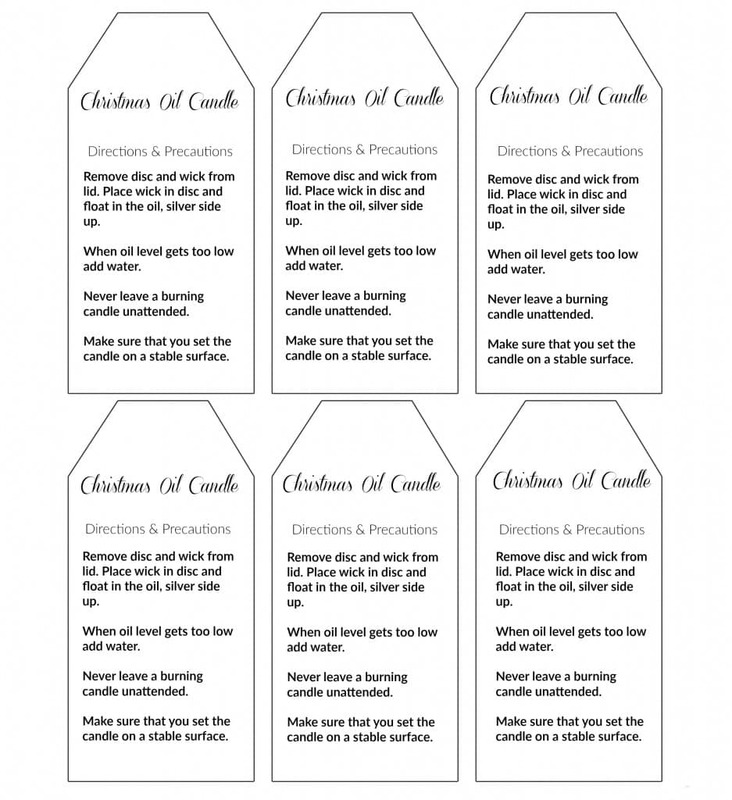 You could check out some candle making sites for more information on strong scents. Also, the wick holder should last a long while however the wick itself will not last that long. You could purchase some additional wicking and cut it up and add it to the gifts or simply tell or write in a message that any piece of wick from an old candle will work for a replacement. I’m sure your coworkers and neighbors will love your gift. Thanks for sharing. I want to try it. These are so beautiful! Thank you so much for sharing. I don’t know anything about essential oils, though. How much do you add? How do you add them? You can use essential oils or fragrance oils. It’s hard to give an exact amount as they all have different strengths. Especially with essential oils. Some you smell right away and then they dissipate. Others are stronger. The best way to do it is to try testing the scent to see if you like it and write down how much you used. I remember using a lot of orange, maybe 50 drops or about 1/2 teaspoon. I did not use near that amount of rosemary, maybe 15 drops. The pine cones were already scented with cinnamon when I bought them, and the oranges, cranberry and pine have their own natural scent. I will also say that this project is not like a scented candle. It’s more for beauty and scent. Do you fill the whole jar up with oil? If so wouldnt the other things in the jar burn when all the oil has burned up and theres nothing left? Or do you only add a small amount of oil on top of water that you already poured in the jar? Two things you do need to leave some room at the tip for the oil so that your materials do not burn. Second after the oil burns and the level goes down you will have to add more oil. Originally I mentioned adding water. This works as the oil it lighter and the water will stay at the bottom. However, after a while the water got murky and it did not look pretty so I suggest more oil. One reader suggested vinegar and I think that may also work but I have not tried it. These are lovely! I definitely want to try them. 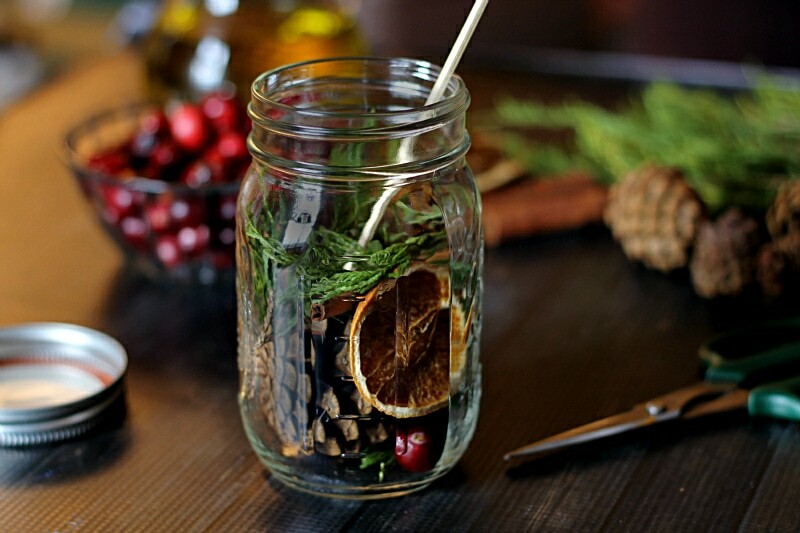 What do you think about starting with a potpourri mixture? Especially in terms of lasting longer. I’m so glad you like the oil lamps. I don’t see why the potpourri would not work. Is there any concern of the embeds burning, smoking, catching fire….. etc? Yes, to some degree, you always need to keep an eye on candles… That why I included the safety tips on my gift. Make sure there is plenty of room between the materials and the floating wick. What a lovely, lovely idea. Middle of the year gives me time to make some of these. I love your projects! You always inspire me to try make fun things, thank you! Thank your for such great and detailed directions! Beautiful candles! Thank you! And I’m guessing the oil will preserve it. Probably start decomposing when you add water..Wonder if vinegar in the water would help? 🙂 Knowing they lasted 3 weeks is a great help. These are stunning, wonderful gifts. Do you have an idea of how long the botanicals last in the oil? I really cannot say. I made some about three weeks ago and they still look good. I also think it may depend on what you put inside whether they will last longer or not. You don’t mention what you did specifically with the jar lid and your photos don’t show the lid on while the candle is burning? Did you cut a whole in the lid (disc) and then run the wick through it and screw the top back on and do you leave it that way while its burning? I’m thinking if you do it like in the photo with no lid and the wick burning the wick will eventually float down into the oil. I hope that answers your question. Have a Merry Christmas! I have used clear, unscented lamp oil when I have made my mason jar lamps. When the oil level goes down, just add more of the lamp oil. Items in the jar are preserved in the oil, and I have never had to replace anything because it molds or dis-colors. When I made one, I also used a glass-wick holder that was placed in a drilled hole in the lid. That’s good to know. Thanks for sharing Sandy. So if you use a floating wick you don’t need the hardware? Janet, there is no hardware. The floating wick just floats on top of the oil as shown in the top pic. Hello, saw your link on Blogtalk. These are gorgeous! Pinning and FB sharing 😉 Merry Christmas! Beautiful! I have to give this a try! This is Fantastic – I just finished all my giving for this season so this one I’ll have to save for next year. Love it! These would also look amazing at the dinner table so I might have to think about trying this on a small scale. So pretty and I like that little touch of red, to simple..
Can you use mineral oil instead of cooking oil? I’m not sure Kathy. I have never worked with mineral oil. I did a quick search and it looks like people use it for candles, so I guess it might be worth a try. Let me know how it works for you. How long do these candles typically last if they’re unopened? I would like to make them now, but I don’t want the stuff inside to turn before Christmas. Planning to make them as gifts. Thx! Karly, they should be more than fine for Christmas. I only noticed some cloudiness on mine after I had added water and even then it was a couple weeks.